In 1067, William started building the Tower of London to show everyone how powerful he was. The Normans then quickly ordered the construction of many other castles to show the English that they were now in control. They also became bases for ruling the surrounding countryside. the bailey was the courtyard at the bottom of the mound with: living quarters, stables, workshops and perhaps a chapel. A ditch and a palisade (wall) surrounded the castle to help protect it. A drawbridge connected the bailey to the top of the motte – people would run up here if they thought the bailey defences would not hold. Norman castles were always built around a well which could provide water for the people to drink if the castle was under siege. 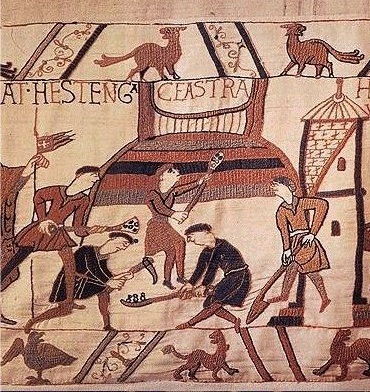 Many people in England hated the Norman invaders as they imposed their new way of life across the country and there were rebellions across much of the north, in places like Durham and York. In just three years after their invasion, English rebels had killed around 1,000 Normans – about a fifth of the invasion force.